I Me My: "India Calling" - Anand Giridharadas' Planned Bestseller. A Smart Calling! 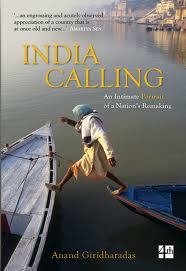 "India Calling" - Anand Giridharadas' Planned Bestseller. A Smart Calling! “India Calling” provides a vision of the present day India as seen through the eyes of a second generation Indian American, Anand Giridharadas, who back tracks the journey his parents made some few decades ago to locate to a foreign land in order to provide him a better life. However, unlike his parents, the writer’s journey is not altruistic; he makes his journey by himself, and for himself. The author has repeatedly claimed that he is trying to see and understand India and not judge it; an expected stance for a writer. Yet, as a reader all I did while reading “India Calling” was just that. I judged Mr. Giridharadas at every point, especially his motive behind writing this piece! Though I liked what he wrote, and enjoyed the way he presented the ‘calling’ in the novel, but there was something amiss about the book that made me uncomfortable. Every writer has a purpose behind his write and I am still unsure about Mr. Giridharadas’ motive for writing this novel. As an established reporter and columnist who recognizes the pulse of current day readers, did he simply churn out a piece that was an exact fit for that need? India as the world's second fastest growing economy but also home to one of the most ancient cultures of the world, is quite the mouth watering recipe for a best seller, especially if it is authored by an American whose roots are freshly pulled out of India! From the moment I started reading the book, I kept hearing myself say, “Oh, he would say that”, or “I knew he’d mention that”. It is this ‘expectedness’ in the novel that prevents me from saying outright, “Yes, I really enjoyed this read”. Even the romance between Ravindra and the girl that ends in an anti climax, is foreseen almost anticipated by the reader. The girl breaks up with Ravindra and goes along with the ‘arranged marriage’ her parents have set up for her; in keeping with the realm of what's 'expected'. Similarly, the fact that the reader knows the caste of almost all of Mr. Giridharadas’s characters in the novel is also something I ‘expected’. It's almost as if Mr. Girdharadas capitalizes on some stereotypes of India and does it with such élan that most readers would not even notice. This novel had to sell because it was designed to be a best seller by an articulate and clever writer. Mr. Girdharadas knew exactly what it would take to lure readers from both India and the West. In "India Calling" he presents a setting most Indian readers would willingly take ownership of and empathize with; at the same time, Mr. Giridharadas keeps the Western reader entranced with an exotic experience providing intimate snapshots of Indian society still indulging in arranged marriages and the caste system. Anand Giridharadas is a master writer no doubt, and “India Calling” is definitely a riveting read, and in spite of my aforementioned uneasiness, I would be doing injustice to the novel if I didn’t recommend it as a good read. Thanks for talking about this book: another one I am dispensed to read. There is however one point I disagree with you: there are no planned bestsellers. If it would be possible to plan this, many impoverished writers would plan one now and then to lay their hands on some money to make a decent living. The Indians, like the Chinese, seem to know how to make money out of improbable situations. Sure, they are not the only ones. Look at all those overfed gourus, those preachers of oriental wisdom with a heavy bank account. Or the Indo-American journalist Fareed Zakaria who talks endlessly on all media about "what we should do". i will trust your discomfort better. Anyway modern writing does not work for me.. so well!! Good to hear from you Georg...and I loved the compliment you paid to the Indians and Chinese that they "seem to know how to make money out of improbable situations"